The first half of 2016 has blown away temperature records, capped off by a record hot June, once again bumping up the odds that 2016 will be the hottest year on record globally, according to data released Tuesday. The monthly numbers from NASA and the National Oceanic and Atmospheric Administration puts the planet on track to surpass 2015 as the hottest on record. Every month this year has been record warm globally. “2016 has really blown that out of the water,” Gavin Schmidt, the director of NASA's Goddard Institute for Space Studies, said. While 2016 has gotten a boost from an exceptionally strong El Niño, the record temps are mostly the result of the excess heat that has built up in Earth’s atmosphere due to accumulating greenhouse gases. That heat is raising global sea levels, disrupting ecosystems and leading to more extreme weather events. Every month this year has been record warm globally. Several months early in the year were the first ever recorded to exceed 1°C (1.8°F) above average. In NOAA’s records, that makes an unprecedented 14 consecutive record-hot months. While that streak will eventually end, Deke Arndt, the head of the climate monitoring division at NOAA’s National Centers for Environmental Information, said that the long-term warming trend is stll clear. "It's important to keep perspective here. Even if we aren't setting records, we are in a neighborhood beyond anything we had seen before early 2015," Arndt said in an email. "We've left the 20th century far behind. This is a big deal." With June’s record heat, the year-to-date is 1.89°F (1.05°C) above the 20th century average, according to NOAA, and 1.96°F (1.09°C) above the 1951-1980 average according to NASA. The temperatures “are so in excess of any first part of a year that we’ve seen,” Schmidt said. 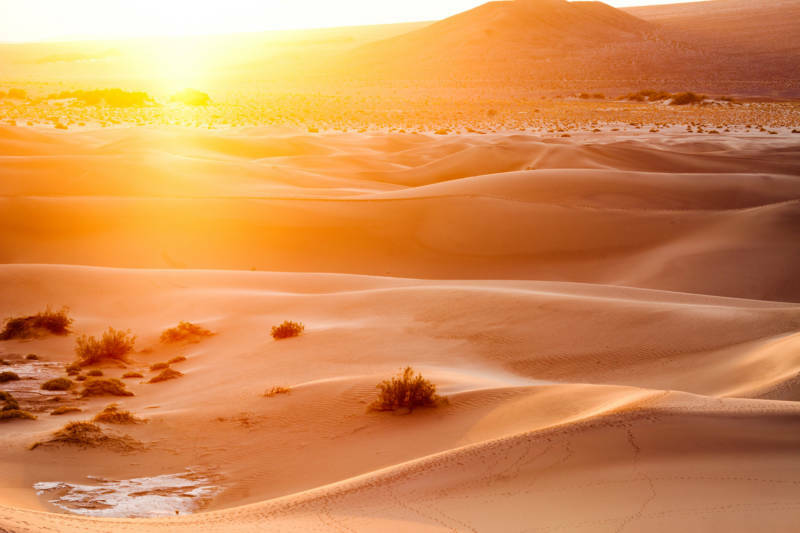 Each agency uses different methods of processing the global temperature data, as well as different baselines for comparing temperatures, leading to slightly different results. Both agree on the long-term warming trend, though. Nations have agreed to a goal of keeping warming under 2°C (3.6°F) above temperatures from preindustrial times — before manmade greenhouse gases began building in the atmosphere — by the end of the century. To put current global temperatures into the perspective of that framework, Climate Central has been reanalyzing the NASA and NOAA data. The two datasets are averaged and then compared to the average from 1881-1910, closer to the preindustrial era. Through June, 2016 was 2.4°F (1.34°C) above the average for that period. The Arctic has been one of the areas of the world that has seen sky-high temperatures this year, which have led to record-low sea ice levels. Those roasting Arctic temperatures have extended into Alaska. The state’s average temperature is 9°F above the 1925-2000 average for the year through June. The North Slope town of Deadhorse just recorded a temperature of 85°F (29.4°C), the hottest temperature ever measured within 50 miles of its Arctic coast. The oceans are another area that have seen persistent warmth. According to NOAA, the global average ocean temperature for the first half of the year is 1.42°F (0.79°C) above the 20th century average, the largest such departure in 137 years of records. These elevated temperatures have led to a record third year of a global coral bleaching event. Water changes temperature more slowly than the air or land, which means the global ocean heat is likely to persist for some time. In part because of that, temperatures are likely to stay elevated for the remainder of the year, even if they drop off the record pace. Whether 2016 ultimately bests 2015 depends on how the second half of year goes. Forecasts have backed off predictions of a La Niña this fall; La Niña tends to cool global temperatures. The significant lead that 2016 has makes the odds good that the year will end up the warmest, though there is no guarantee. 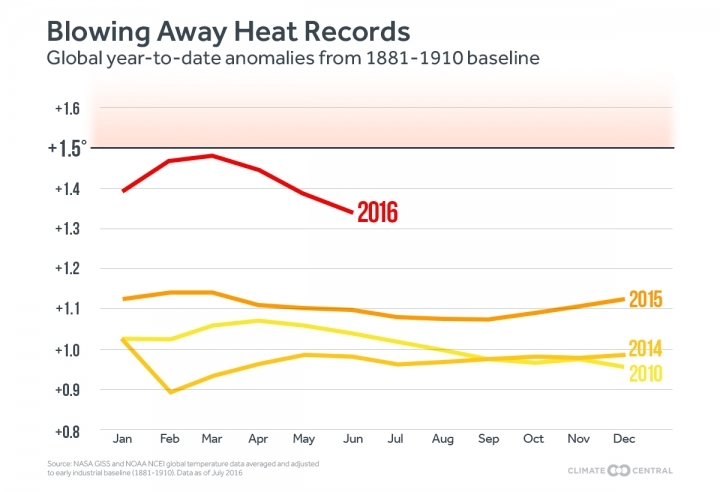 Regardless of where 2016 falls, the long-term trend of warming is clear, and it has tipped the odds in favor of record heat: Of the 15 warmest years on record, 14 have occurred in the 21st century. 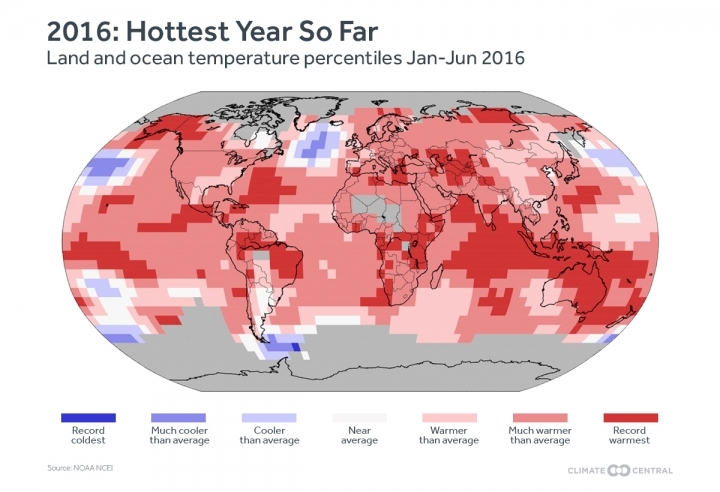 "2016 will be one of the warmest on record. Whether it slips to nominally above or nominally below 2015, that may depend on some climate variability factors like the strength of the La Niña," Arndt said. "But it will share with 2015 the distinction of being, comfortably, the two warmest years on record and warmer, comfortably than any year we've measured in modern times."